I need more urban fantasy in my life. 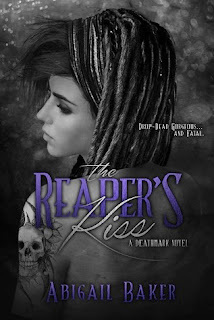 The Reaper's Kiss appealed to me because the blurb reads like solid urban fantasy or perhaps paranormal romance. I need more of these things in my life. I've been reading a ton of contemporary romance and historical romance lately and I craved the balance this book would bring to my reading load. So, good. The Reaper's Kiss has some really great urban fantasy elements. Right off the bat, Ollie is a tattoo artist who actually marks people for death, making it easier for their assigned reaper to, ah, reap them. It wasn't obvious to me why the reapers needed that assist, but okay, I was willing to go with it. I love that the book is set mainly in Quebec City. It's such an uncommon location that I reveled in it. There are some great details that reflect the history of the city, and it was such a treat to spend the majority of the book there. The Reaper's Kiss moved pretty quickly for me. There was a lot of ground to cover, as Ollie has to cope with the unwelcome attentions of higher-ups alongside being pulled into the rebel efforts. I didn't buy into the relationship between Ollie and Brent--there wasn't enough build for me, and I didn't think they had great chemistry, though I liked both characters. There are some touching moments near the end of the book that I appreciated objectively, but that had me wishing that I *did* buy into the romance more so that I could get the full effect of those scenes. Ultimately, the bigger plot had me engaged with the book, even while the romance was a letdown. I do want to know what happens next, and I'll be curious to see where Baker takes the story after ending this one on quite the question mark. Also, I really hate the way that Ollie's hair looks on the cover. She's rocking dreads, but there's something about the way they appear in that image that bugs me. Just saying. If you like urban fantasy, I think The Reaper's Kiss is a good choice. It feels a little lighter than other urban fantasy I read (possibly it leans to the paranormal romance end of the spectrum), but it was a still a satisfying read.